Mark Waugh was described by Sir Donald Bradman as, “The most elegant and graceful cricketer of the modern era.” He will certainly be remembered as one of the finest cricketers this country has ever produced. 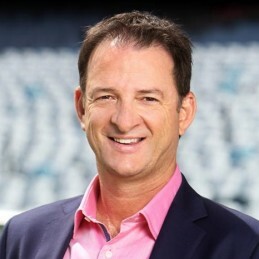 Over 19 years playing with NSW and 14 years at the elite level of Australian cricket, Mark Waugh’s career was studded with records. He played 22 World Cup Matches and is one of only seven Australians to have played more than 100 Tests. From the moment of his one-day international debut against Pakistan in 1988-89, he was a near-permanent fixture in an Australian side that has enjoyed outstanding success, including the 1999 World Cup and the record-breaking streak of 16 consecutive Test wins. He was Australia’s third highest run-scorer in test history (7,800) and one of just six Australians to score more than 7000 test runs. Only his twin brother, Steve Waugh (9,734) and Allan Border (11,174) achieved a higher Test run record. Furthermore, Mark is the leading run scorer for Australia in One Day cricket history with 8500 and he holds the record for the most runs in a One Day match by any Australian (173 runs). In the 1998 season, Mark Waugh scored an incredible 1000 Test runs. Mark was an inspiration to his teammates and a host of young players because of the way he played the game – hard but fair and in a positive way. He was always keen to entertain his fans. Mark retired from First Class cricket in March 2004 and was awarded with an AM in Australia Day 2005 for his services to cricket and the community. Since retiring, Waugh has commentated with Fox Sport and been extensively engaged as a public speaker. Mark is married to Group One winning horse trainer, Kim Moore. Together they have a highly successful horse syndication business.